This is the first book covering the basics and the state of the art and important applications of the complete growing discipline of computational intelligence. This comprehensive handbook presents a unique synergy of various approaches and new qualities to be gained by using hybrid approaches, incl. inspirations from biology and living organisms and animate systems. The text is organized in 7 main parts foundations, fuzzy sets, rough sets, evolutionary computation, neural networks, swarm intelligence and hybrid computational intelligence systems. 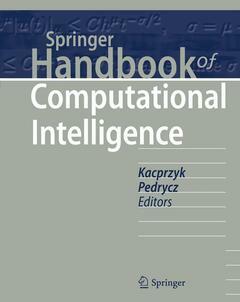 Janusz Kacprzyk is editor in chief of the Springer series Studies in “Computational Intelligence”, “Studies in Fuzziness and Soft computing”, “Advances in Intelligent and Soft Computing” and “Intelligent Systems Reference Library”. He is the recent past president of the International Fuzzy Systems Association (IFSA) and recipient of the pioneer award of the IEEE Computational Intelligence Society. Witold Pedrycz is the Editor-in-Chief of IEEE Transactions on Systems Man and Cybernetics-part A, Editor-in-Chief of the journal “Information Sciences” (Wiley) and Associate Editor of the IEEE Transactions on Fuzzy Systems. Witold Pedrycz is a recipient of the prestigious Norbert Wiener award from the IEEE Society of Systems, Man and Cybernetics.